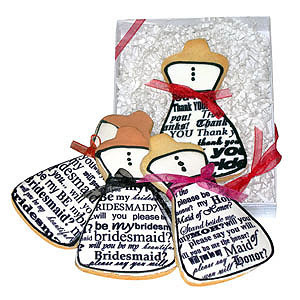 Elegant Engagements Wedding and Event Planners: Will You Be My Bridesmaid? Putting some thought into how you ask your bridesmaids to stand up for you at your wedding will really let them know how much they mean to you. It will also set an example of how fun and unique your event will be. A small note card that asks the question - this gives you a good opportunity to write a few personal words. Toast to your friendship - buy a bottle of champagne for each lady, attach a little note to each that 'pops' the question. Something a little more extravagant and in lieu of a bridesmaids gift given closer to the wedding. 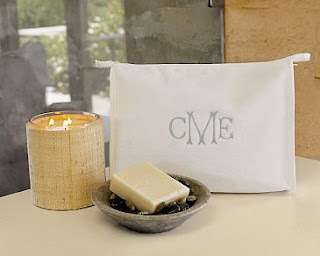 Put together a little gift bag and enclose some spa items, a journal or maybe a beach towel and flops. Invite all the ladies to dinner and present them with their gift that will surely get them excited. Order the Lands End canvas bag $15.50 or 19.50 or even a cute colorful bag from Beau-Coup $25. 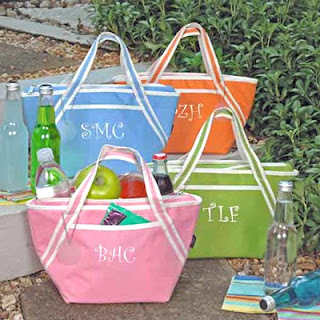 You don't have to give the ladies all the same thing - how about customize with a monogrammed bracelet, a small purse or cosmetic bag. Ahhh, who am I to complain. I can't get through a single day without using my R4 / R4i! I love that there are so many ways in which you can ask your bridesmaid to be a part of your special day! It's such a fun and special thing, to send a cookie, for example, to "pop" the question! Cheap and trendy deisgner clothing from ronkaclothing.com where we sell: Beauty, Jumpsuit, Theory, Amanda Uprichard, Left on Houston, MATT & NAT, One of a Kind, Brian Reyes, Alexia Designs, Beyond Vintage, Kettle Black, Charlie My Love, http://www.eicop.org/pc-412-53-velvet-loleen-scoop-tee.aspx, Nixon, Covertible Dress, Bec & Bridge, Women's, Blazer, Elise Overland, Flats, Steven, Yoana Baraschi, Short Sleeve, Susana Monaco, eDM, Vintage Havana, Freelook, Vince, Wayne, Christmas Gifts, Brachfeld Parlaghy, Cocktail Dresses, Dessy Group, camilla and marc, Vera Wang Lavender Label, Kite and Butterfly, Citizens of Humanity, Olivia Harris by Joy Gryson, Business Accessories Business Electronic Travel Accessories, Pedro Garcia, Ami Clubwear, Maloles, Sandals, Geren Ford, Jax, Vince, D&G, 3.1 Phillip Lim, Dar-Ti, Lingerie, Sentimental, Maloles, Tart, Calvin Klein Underwear, 291, Greylin, Helmut Lang Denim, Bec & Bridge, TEXTILE Elizabeth & James - all available from our online designer clothing store at 50% off sale! Check out http://arts.harvard.edu - harvard university arts and fashion. My bridesmaids live in different areas, and I would like to create a personalized label for a bottle of champagne and have them sent to each maid. However, I do not think you can mail alcohol. I have looked online and seen plenty of places where you can create your own label for wine/champagne...but they all have to be mailed to one place. Any suggestions? !